Background: Sodium arsenate (As), a toxic substance with induced oxidative stress, lead to hepatotoxicity. Olive oil (OO) with antioxidant property has protective effect on toxicity. The aim of this study was to investigate protective effect of OO on sodium As-induced hepatotoxicity in mice. Subjects and Methods: In this experimental study, 32 adult male BALB/c mice were divided randomly into four groups: control group (received only normal saline, the same volume as other groups), OO (0.4 mL/day, gavage), sodium As (15 mg/kg, gavage), and OO + sodium As (received OO 1 h before sodium As). Drugs were given for 30 consecutive days. After the last receipt of the drugs, oxidative stress parameters [malondialdehyde (MDA), glutathione (GSH)] in tissue, liver function parameters [alanine aminotransferase (ALT), aspartate aminotransferase (AST), and alkaline phosphatase (ALP)] in serum, ferric reducing ability of plasma (FRAP) in plasma, and histopathological assays were performed. Results: Sodium As induced hepatic injury as indicated by significant increase in AST, ALT, ALP, and LDH in serum and pathologic evidences. It also induces hepatic oxidative stress biomarkers as indicated by significant increase in levels of MDA and significant decrease in FRAP and GSH concentration. OO administration significantly improved oxidative stress parameters, histopathological changes, and enzymatic markers of liver injury. Conclusions: It was concluded that antioxidant activity of OO has hepatoprotective effect on As-induced hepatic injury. Olive oil (OO) is a Mediterranean diet, and individuals with this diet habit have a low incidence of cardiovascular diseases, neurological disorders, and breast and colon cancer risk. Polyphenols as bioactive molecules in OO are resistant against environmental stress and as free radical scavengers are responsible for intrinsic defense against auto-oxidation of unsaturated fatty acids. In previous studies, it has been reported that OO having anti-apoptotic, anti-inflammatory, and anti-oxidative properties protects the tissues against damage caused by oxidative stress., The protective effect of OO on hepatotoxicity induced by deltamethrin, cadmium, acrylamide, and aluminum  was demonstrated in previous studies. Based on the foregoing, a hypothesis is raised that OO having antioxidant property is effective in liver toxicity induced by arsenic. Therefore, this study was designed to determine the effects of OO on hepatotoxicity induced by arsenic, through serum and tissue biochemical markers and histopathological evaluation in liver of mice. Olive fruits were collected in the harvest season from the city of Roodbar in the Gilan province of Iran. Tyrosol was purchased from Sigma (Cat. no. 188255) and sodium arsenic from Merk Company. OO was extracted by mechanical procedure without the use of any solvent. In this way, we washed the olives and then the core was separated and ground. The milled olives were heated to two temperatures to give off their oil. Then the oil was separated from the pulp using a filter. The olive extract was standardized based on tyrosol as the major active ingredient. About 2.5 g of OO was extracted using HCl 2M with vigorous shaking for three times. The bottom phase containing phenols was removed each time. They were mixed together and eventually concentrated to liquid chromatographic studies. High-performance liquid chromatography (HPLC) apparatus (Knauer Assoc., Germany) was equipped with C18 column (5 μm, 4.6 × 250 mm i.d. ), diode array detector. The filtered OO and several concentrations of tyrosol were injected on HPLC column for drawing standard curve, and then chromatograms were recorded at 280 nm. H2O: methanol (90:10) as a mobile phase was passed through the column at a flow rate of 1 mL/min in a gradient elution mode and then reached to fully methanol in 45 min. The chromatographic data analysis was done with ChromGate Software (Germany). Subsequently, the amount of tyrosol (phenol) in the OO was obtained using peak surface area and standard curve [Table 1]. In all, 32 adult male BALB/c mice (weighing 25–30 g) were obtained from Animal Research Center of Mazandaran University of Medical Sciences, Sari, Iran. The animals were housed under standard conditions (21 ± 2°C, 60% ± 5% humidity, and 12:12 h light–dark cycle) with free access to standard chow and tap water. All the experimental procedures were designed in accordance with the Institutional Animal Ethics Committee of the Mazandaran University of Medical Sciences. All animals were randomly divided to four groups (eight per group) – Group I: mice received normal saline (the same volume as other groups); Group II: mice received OO 0.4 mL/day ; Group III: mice received sodium As at 15 mg/kg/day; and Group IV: mice were received sodium As + OO. All groups received once daily for a period of 30 days through gavage. OO was administered 1 h before sodium As treatment. All the mice were anesthetized with ketamine (50 mg/kg) and xylazine (5 mg/kg) at the end of the 31st day of treatment. Blood samples were collected from the heart, and then centrifuged at 4000 r/min for 10 min. Serum samples were separated to evaluate biochemical analysis. Then the animals were killed, and a small portion of liver tissue was immediately removed, cleaned, washed with phosphate buffer saline (pH 7.4), and then stored at − 70°C for subsequent tissue biochemical analysis and then the other parts of liver were fixed in 10% buffer formalin for histopathological studies. Ferric reducing ability of plasma (FRAP) was measured using 2, 4, 6-tripyridyl-s-triazine (TPTZ) reagent as described by Benzie and Strain. This method measures the ability of the antioxidants contained in the sample to reduce ferric-TPTZ (Fe3 + TPTZ) to its ferrous form (Fe2+) which absorbs light at 593 nm. FRAP was calculated by plotting a standard curve of absorbance against μM/L concentration of Fe (II) standard solution. Lipid peroxidation was measured in liver by estimating the level of thiobarbituric acid reacting substances (TBARS). A weighted portion of tissue was homogenized in phosphate buffer (100 mM, pH 7.4) and TBARS was determined using TBA reagent. Liver GSH was measured using Ellman's reagent. Briefly, tissue homogenate (2.5%, w/v) was prepared in buffer containing 0.02 M EDTA. Two milliliters of the homogenate, 1.8 mL of water, and 0.4 mL of TCA (50%, w/v) were mixed thoroughly to precipitate proteins. Then 2 mL of the supernatant was transferred to a tube containing 100 μL 5,5′-dithiobis (2-nitrobenzoic acid) (0.01 M in ethanol), 4 mL Tris-base buffer (0.4 M, pH 8.9), and then the absorbance was recorded at 412 nm. GSH levels were calculated from a standard curve plotted by GSH. To investigate the functional activity of liver, serum alanine aminotransferase (ALT), aspartate aminotransferase (AST), alkaline phosphatase (ALP), and lactate dehydrogenase (LDH) enzymes were measured using an automatic chemical analyzer using kits obtained from Pars Azmoon Co. (Iran; Cat. no. 1400018 and no. 1400002). For histopathological assay and to study the effect of As and OO on liver, samples were fixed in 10% (w/v) formalin for 24 h. After processing and embedding in paraffin using standard protocol, sections with 5 μm thickness were stained with hematoxylin and eosin for evaluation of liver damage. Sample sections were evaluated with ×40 magnification for assessment of the degree of liver injury by a pathologist who was blinded to the treatment groups. For quantitative analysis, histological photomicrographs were evaluated by scoring system. According to the extent of sinusoidal dilatation, inflammatory cell infiltration, congestion, degeneration, and cytoplasmic vacuolization were scored as 0 (normal), 1 (mild), 2 (moderate), or 3 (severe). Data were expressed as mean ± SD. Statistically analysis of variance (ANOVA) was estimated using one-way ANOVA with Tukey's comparison in GraphPad Prism version 7.00(GraphPad Software, San Diego, CA, USA). P < 0.05 was considered statistically significant in all groups. Tyrosol as the main phenolic compound was analyzed by HPLC method in OO [Figure 1]. The retention time of tyrosol was 26.9 min and the results showed that OO contained 42.5 μg tyrosol/g of OO which is significant. Effects of OO on lipid peroxidation product and antioxidant-biomarker (GSH) in the all groups are given in [Figure 2]. Sodium As exposure led to a significant increase in MDA and significant decrease in GSH level and FRAP value in comparison to control group (P < 0.05). Administration of OO in sodium As-treated mice was effective in improving the MDA, GSH, and FRAP levels in comparison to the arsenate-treated mice (P < 0.05). The results of enzyme activities in the all groups are presented in [Table 2]. Mice exposed to As showed significant increase in serum hepatic enzymes (AST, ALT, ALP, and LDH levels) in comparison to the control group. On the other hand, administration of OO effectively improved hepatic enzyme levels in comparison to the sodium As-treated mice. 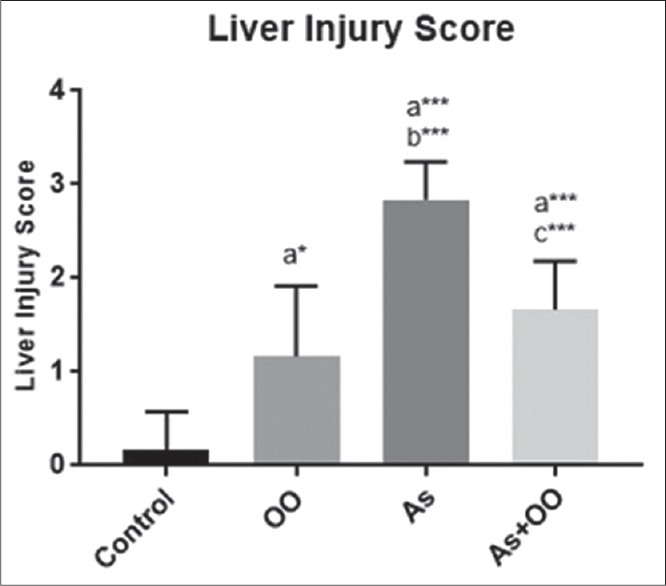 It should be noted that liver injury markers significantly increase in the OO group compared with the control group. The photomicrographs of liver in the all groups are presented in [Figure 3]. Normal histoarchitecture (normal hepatic lobules) with normal hepatocytes, sinusoids, and Kupffer cells were observed in control group [Figure 3]a. Administration of As for 30 days caused disorganization and severe focal necrosis with pyknotic cellular nuclei of hepatocytes, vacuolization, granulomatous formations, fibrosis, hyperproliferation of Kupffer cells, and peripotal leucocyte infiltration [Figure 3]c. Although the structure of the liver in OO alone showed a slight damage with mild inflammation [Figure 3]b, OO markedly improved liver structure in As-treated mice [Figure 3]d.
The histograms of the semi-quantitative analysis of liver in all groups are shown in [Figure 4]. Sodium As increased liver injury score compared with control group (P < 0.001). Score of liver injury in As-treated mice with OO treatment was lower compared with As group (P ≤ 0.006). OO created a mild injury in the liver tissue compared with control group (P ≤ 0.02). Arsenic as metallic element is highly toxic. The liver, the main and sensitive organ in the metabolism of arsenic, plays a role in methylation of arsenic. The results of this study showed a significant increase in serum levels, ALT, AST, ALP, and LDH in As-treated animals, which confirms significant impairment in liver function. In addition, increasing MDA and decreasing GSH and FRAP confirm oxidative stress. To our knowledge, this is the first study that demonstrates protective effect of OO against sodium As-induced intoxication. Although the administration of OO at 0.4 mL resulted in slight damage to the liver, simultaneous administration of arsenic and OO for 30 days protected liver against oxidative stress-induced hepatotoxicity. As with ROS generation and imbalances in pro-oxidant/antioxidant status leads to oxidative stress and thus toxicity. Production of free radicals causes lipid peroxidation and subsequently leads to cell membrane damage and inhibition of enzyme production/reduction in activity, reduction in cell function, and eventually cell death., In this study, As exposure significantly increased lipid peroxidation up to 37%. Kharroubi et al. showed in their study that sodium As increases MDA level in rat up to a 35%. In addition, in our study, OO significantly increased MDA level, which was in contrast to Khalatbary's study. Whereas the same dose (0.4 mL OO) was used in both studies. This difference may be attributed to origin, cultivation area, and purity parameters of OO. However, administration of OO with arsenic could significantly reduce the amount of MDA that may be related to their preventive effects of OO. This study also showed up to a 49% reduction in cellular GSH following sodium As exposure through gavage. GSH is as an important cellular antioxidant and essential cofactor for As methylation. During As exposure, GSH, with reduction in H2O2, and lipid hydropeoxide play a protective role in cell damage. Most of the proteins are synthesized in the liver and damage to this organ reduces production of proteins especially enzymes. Arsenic toxicity leads to interaction with sulfhydryl groups of proteins/enzymes, inhibition of cellular respiration in mitochondria, producing reactive forms, reactive oxygen species (ROS), and hence oxidative stress. The GSH level in liver tissue was significantly (P < 0.001) decreased in As group when compared with control group. However, OO administration in As-treated mice significantly increased GSH level compared with As-treated mice. GSH as a sulfhydryl (-SH) group antioxidant compound protects mitochondria molecules and inhibits production of free radicals. The significant decrease in GSH level in liver tissue might be due to binding of arsenic with sulfhydryl groups of GSH in arsenic exposure. OO have polyphenolic compounds and flavonoids can scavenge free radicals. In this study, OO significantly protects liver against oxidative stress induced by arsenic, probably due to its antioxidant and free radical scavenging properties of OO. OO have bioactive compounds such as polyphenols, hydrocarbons, phytosterols, and triterpenes. These phenolic compounds of OO have potentially advantageous biological effects such as antimicrobial, antioxidant, and anti-inflammatory properties. Flavonoids by maintaining hepatocellular membrane stability prevent from cellular leakage and enhance hepatic regeneration. In addition, OO with polyphenol-rich compounds and a rich source of fats is able to reverse metabolic disorders and reduce coronary heart disease and cancers. Hydroxytyrosol and oleuropein from phenolic compounds of OO play a role in its taste and stability. In addition, these phenolic compounds with intense antioxidants have healthful effects. Literature has shown hepatoprotective properties of OO against hepatotoxicity induced by aluminum and acrylamide, high-fat “Western-type” diet, deltamethrin. It was also shown that administration of OO for 30 days significantly decreases levels of serum ALP, AST, ALP, and LDH in As-treared mice. Arsenic at high doses increases free radicals, consequently causing liver injury. Acute hepatic injury and hepatocellular necrosis induced leakage of hepatocellular enzymes into blood. Therefore, liver damage is detected by the activity of AST, ALT, and ALP in serum. Increased levels of serum liver enzymes have been confirmed by previous studies. It was shown in a study that extra virgin OO decreases oxidative stress and plays a hepatoprotective role. In this study, the above enzymes increased in OO alone. But OO administration prevented the increase of these markers in sodium AS-treated mice. These findings revealed that OO preserves the structural integrity of cell membrane against arsenic-induced tissue damage. The above results showed subacute As exposure induced hepatic injury. The results of biochemical and histopathological examination confirm the antioxidant role of OO. Hence, the hepatoprotective effect of OO against sodium As could be attributed to the presence of free radical scavenging and antioxidant properties of OO. Therefore, the diet of OO at a moderate level can be recommended to reduce the toxic effects of arsenic. This research was supported by the Faculty of Sciences, Golestan University, Gorgan, Iran (ID: 1274347), and Molecular and Cell Biology Research Center, Mazandaran University of Medical Sciences, Sari, Iran. Nuntharatanapong N, Chen K, Sinhaseni P, Keaney JF. EGF receptor-dependent JNK activation is involved in arsenite-induced p21Cip1/Waf1 upregulation and endothelial apoptosis. Am J Physiol Heart Circulat Physiol 2005;58:H99. Andrew AS, Jewell DA, Mason RA, Whitfield ML, Moore JH, Karagas MR. Drinking-water arsenic exposure modulates gene expression in human lymphocytes from a US population. Environ Health Perspect 2008;116:524. Rahman A, Vahter M, Ekström E-C, Persson L-Š. Arsenic exposure in pregnancy increases the risk of lower respiratory tract infection and diarrhea during infancy in Bangladesh. Environ Health Perspect 2011;119:719. Smith AH, Marshall G, Yuan Y, Ferreccio C, Liaw J, von Ehrenstein O, et al. Increased mortality from lung cancer and bronchiectasis in young adults after exposure to arsenic in utero and in early childhood. Environ Health Perspect 2006:1293-6. Argos M, Kalra T, Rathouz PJ, Chen Y, Pierce B, Parvez F, et al. Arsenic exposure from drinking water, and all-cause and chronic-disease mortalities in Bangladesh (HEALS): A prospective cohort study. Lancet 2010;376:252-8. Sharma S, Gill AS, Singh Z, Kaur C, Vijaya P. Nephrotoxic effects of arsenic in Albino mice. Am J Biosci 2016;4:1-4. Wang X, Zhao H, Shao Y, Wang P, Wei Y, Zhang W, et al. Nephroprotective effect of astaxanthin against trivalent inorganic arsenic-induced renal injury in wistar rats. Nutr Res Pract 2014;8:46-53. Naujokas MF, Anderson B, Ahsan H, Aposhian HV, Graziano JH, Thompson C, et al. The broad scope of health effects from chronic arsenic exposure: Update on a worldwide public health problem. Environ Health Perspect 2013;121:295. Singh MK, Yadav SS, Yadav RS, Chauhan A, Katiyar D, Khattri S. Protective effect of Emblica officinalis in arsenic induced biochemical alteration and inflammation in mice. SpringerPlus. 2015;4:438. Shafik NM, El Batsh MM. Protective effects of combined selenium and Punica granatum treatment on some inflammatory and oxidative stress markers in arsenic-induced hepatotoxicity in rats. Biol Trace Elem Res 2016;169:121-8. Rani VU, Sudhakar M, Ramesh A. Protective effect of Pueraria tuberosa Linn. in arsenic induced nephrotoxicity in rats. Asian J Pharmaceutical Res 2017;7:15-20. Ghabaee Z, Nasiry D, Amiri FT, Moghaddam AE, Khalatbary AR, Zargari M. Administration of zinc against arsenic-induced nephrotoxicity during gestation and lactation in rat model. J Nephropathol 2017;6;74-80. Khalatbary AR, Ghabaee DNZ, Ahmadvand H, Amiri FT, Lehi ST. Deltamethrin-induced hepatotoxicity and virgin olive oil consumption: An experimental study. Iranian J Med Sci 2017;42:586-92. Qu W, Waalkes MP. Metallothionein blocks oxidative DNA damage induced by acute inorganic arsenic exposure. Toxicol Appl Pharmacol 2015;282:267-74. Prabu SM, Muthumani M. Silibinin ameliorates arsenic induced nephrotoxicity by abrogation of oxidative stress, inflammation and apoptosis in rats. Mol Biol Rep 2012;39:11201-16. Mozaffarian D, Katan MB, Ascherio A, Stampfer MJ, Willett WC. Trans fatty acids and cardiovascular disease. N Engl J Med 2006;354:1601-13. Gill CI, Boyd A, McDermott E, McCann M, Servili M, Selvaggini R, et al. Potential anti-cancer effects of virgin olive oil phenolson colorectal carcinogenesis models in vitro. Int J Cancer 2005;117:1-7. Cicerale S, Lucas L, Keast R. Antimicrobial, antioxidant and anti-inflammatory phenolic activities in extra virgin olive oil. Curr Opin Biotechnol 2012;23:129-35. Ghorbel I, Elwej A, Fendri N, Mnif H, Jamoussi K, Boudawara T, et al. Olive oil abrogates acrylamide induced nephrotoxicity by modulating biochemical and histological changes in rats. Ren Fail 2017;39:236-45. Amamou F, Nemmiche S, Kaouthar Meziane R, Didi A, Yazit SM, Chabane-Sari D. Protective effect of olive oil and colocynth oil against cadmium-induced oxidative stress in the liver of Wistar rats. Food Chem Toxicol 2015;78:177-84. Ghorbel I, Elwej A, Jamoussi K, Boudawara T, Kamoun NG, Zeghal N. Potential protective effects of extra virgin olive oil on the hepatotoxicity induced by co-exposure of adult rats to acrylamide and aluminum. Food Funct 2015;6:1126-35. Romero Cn, Brenes M. Analysis of total contents of hydroxytyrosol and tyrosol in olive oils. J Agric Food Chem 2012;60:9017-22. Amiri FT, Karimi S, Khalatbary AR, Mohammadi HR, Hosseinimehr SJ. Hydroalcoholic extract of Zataria multiflora mitigates cisplatin-induced oxidative stress, apoptosis and hepatotoxicity in mice. Marmara Pharmaceutical J 2017;21. Kumar A. Emblica Officinalis protects against sodium arsenite induced hepatotoxicity and nephrotoxicity in rats. Int J Sci 2015;4:47-55. Gupta D, Inouhe M, Rodríguez-Serrano M, Romero-Puertas M, Sandalio L. Oxidative stress and arsenic toxicity: Role of NADPH oxidases. Chemosphere 2013;90:1987-96. Koh E, Carmieli R, Mor A, Fluhr R. Singlet oxygen induced membrane disruption and serpin-protease balance in vacuolar driven cell death in Arabidopsis thaliana. Plant Physiol 2016;171:1616-25. Gupta R, Kannan GM, Sharma M, Flora SJ. Therapeutic effects of Moringa oleifera on arsenic-induced toxicity in rats. Environ Toxicol Pharmacol 2005;20:456-64. Kharroubi W, Dhibi M, Haouas Z, Chreif I, Neffati F, Hammami M, et al. Effects of sodium arsenate exposure on liver fatty acid profiles and oxidative stress in rats. Environ Sci Pollut Res 2014;21:1648-57. Rao CV, Pal S, Mohammed A, Farooqui M, Doescher MP, Asch AS, et al. Biological effects and epidemiological consequences of arsenic exposure, and reagents that can ameliorate arsenic damage in vivo. Oncotarget 2017;8:57605. Saxena G, Flora S. Lead-induced oxidative stress and hematological alterations and their response to combined administration of calcium disodium EDTA with a thiol chelator in rats. J Biochem Mol Toxicol 2004;18:221-33. Stanton CR, Thibodeau R, Lankowski A, Shaw JR, Hamilton JW, Stanton BA. Arsenic inhibits CFTR-mediated chloride secretion by killifish (Fundulus heteroclitus) opercular membrane. Cell Physiol Biochem 2006;17:269-78. Achat S, Rakotomanomana N, Madani K, Dangles O. Antioxidant activity of olive phenols and other dietary phenols in model gastric conditions: Scavenging of the free radical DPPH and inhibition of the haem-induced peroxidation of linoleic acid. Food Chem 2016;213:135-42. Storniolo C, Moreno J. Effect of extra virgin olive oil components on the arachidonic acid cascade, colorectal cancer and colon cancer cell proliferation. Grasas y Aceites. 2016;67:159. Rincón-Cervera MA, Valenzuela R, Hernandez-Rodas MC, Marambio M, Espinosa A, Mayer S, et al. Supplementation with antioxidant-rich extra virgin olive oil prevents hepatic oxidative stress and reduction of desaturation capacity in mice fed a high-fat diet: Effects on fatty acid composition in liver and extrahepatic tissues. Nutrition 2016;32:1254-67. Akhtar MS, Habib A, Ali A, Bashir S. Isolation, identification, and in vivo evaluation of flavonoid fractions of chloroform/methanol extracts of Rheum emodi roots for their hepatoprotective activity in Wistar rats. Int J Nutr Pharmacol Neurol Dis 2016;6:28. Jurado-Ruiz E, Varela LM, Luque A, Berná G, Cahuana G, Martinez-Force E, et al. An extra virgin olive oil rich diet intervention ameliorates the nonalcoholic steatohepatitis induced by a high-fat “Western-type” diet in mice. Mol Nutr Food Res 2017;61. Chapman SE, Hostutler RA. 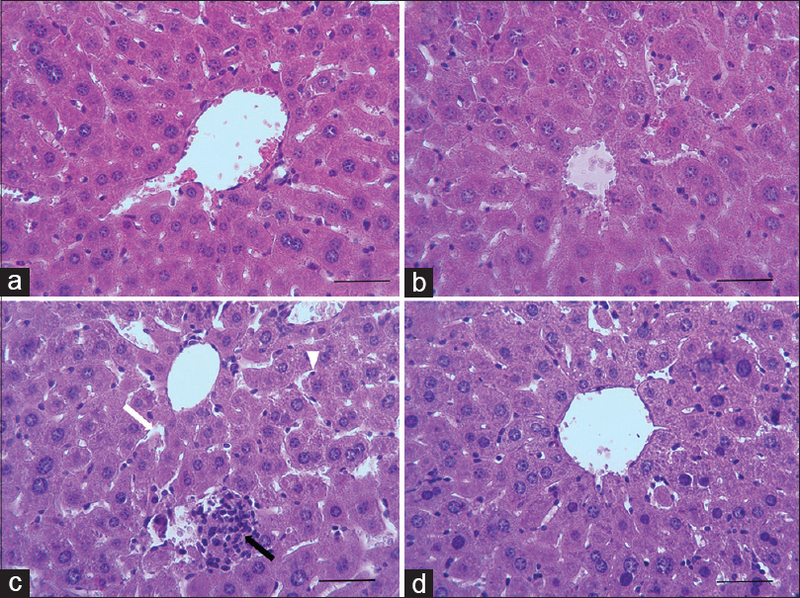 A laboratory diagnostic approach to hepatobiliary disease in small animals. Clinics Lab Med 2015;35:503-19. Gora RH, Baxla SL, Kerketta P, Patnaik S, Roy BK. Hepatoprotective activity of Tephrosia purpurea against arsenic induced toxicity in rats. Indian J Pharmacol 2014;46:197. Debib A, Dueñas M, Boumediene M, Mothana RA, Latifa A, Tir-Touil MA. Synergetic hepatoprotective effect of phenolic fractions obtained from Ficus carica dried fruit and extra virgin olive oil on CCL4-induced oxidative stress and hepatotoxicity in rats. J Food Biochem 2016;40:507-16. Nandi D, Chandra Patra R, Ranjan R, Swarup D. Role of co-administration of antioxidants in prevention of oxidative injury following sub-chronic exposure to arsenic in rats. Veterinarski Arhiv 2008;78:113-21. Aposhian HV, Aposhian MM. Arsenic toxicology: Five questions. Chem Res Toxicol 2006;19:1-15. Liu J, Zheng B, Aposhian HV, Zhou Y, Chen M-L, Zhang A, et al. Chronic arsenic poisoning from burning high-arsenic-containing coal in Guizhou, China. Environ Health Perspect 2002;7:208. Tuck KL, Hayball PJ. Major phenolic compounds in olive oil: Metabolism and health effects. J Nutr Biochem 2002;13:636-44. Manna C, D'Angelo S, Migliardi V, Loffredi E, Mazzoni O, Morrica P, et al. Protective effect of the phenolic fraction from virgin olive oils against oxidative stress in human cells. J Agric Food Chem 2002;50:6521-6.